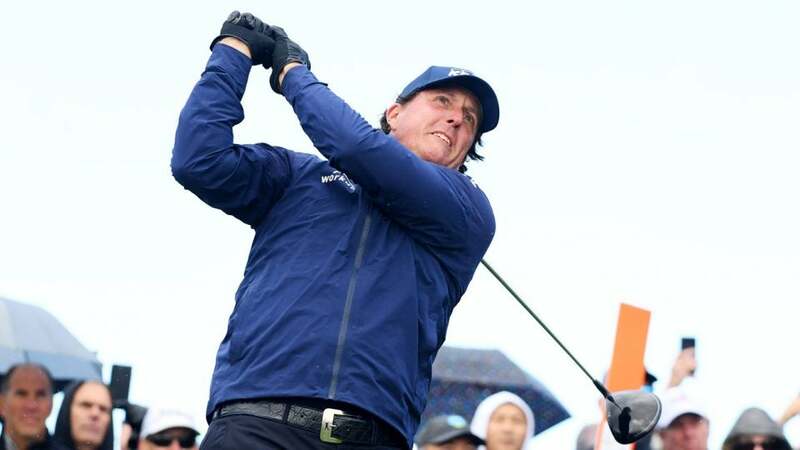 Phil Mickelson hits a drive during the third round of the 2019 AT&T Pebble Beach Pro-Am. The third round of the 2019 AT&T Pebble Beach National is in the books. Phil Mickelson no longer has the lead, and Hosung Choi is heading home after missing the cut. Here’s more on those topics and everything else you may have missed from Saturday at Pebble Beach. Paul Casey continued his recent career resurgence in Round 3, shooting a five-under 67 at Spyglass Hill to take the lead at 15 under heading into the final round. Casey’s round featured six birdies and just one bogey, which came on the par-4 6th hole at Spyglass. On Sunday, the European Ryder Cupper will try to back up his win at last year’s Valspar Championship. Obviously Phil Mickelson would have preferred to maintain a share of the lead, but he’s still got a shot at a come-from-behind victory thanks to a late-round surge on Saturday. Mickelson’s game (magically increased driver swing speed aside) was all over the place on the front nine. He opened bogey-birdie, made a ridiculous spinning wedge shot for another birdie at 4, and then continued to trade bogeys and birdies to finish the front nine in even par, leaving him stuck at 10 under for the tournament. With Casey going low and overtaking the lead, Phil needed some late magic to stay in contention. And he made it happen. Phil made birdie at 13 and eagled the par-5 14th to get to 12 under. He finished off the round with four consecutive pars to shoot a two-under 70. That leaves Mickelson in sole possession of second place, three shots off the lead. Former Dallas Cowboys quarterback and current CBS Sports NFL analyst Tony Romo withdrew from the Pro-Am on Saturday to attend the funeral for former Cowboys assistant coach Wade Wilson. Romo’s legitimate on-course talents will be greatly missed on Sunday, but he still made a mark before he left. On Friday, Romo concocted what might be the birdie of the week when he hit an approach shot from the carpet of a hospitality tent to tap-in range. Hosung Choi entertained the galleries at Pebble Beach all week long, unfortunately his play on the course wasn’t quite good enough to make the cut. Choi made three birdies, four bogeys, and two doubles for a round of five-over 77. We don’t know when we’ll see Choi on the PGA Tour again because he has no official status. But after finally showing the golfing world just how popular he is in the States, there’s a good chance he’ll receive additional sponsor exemptions this season. Jordan Spieth’s second round was interrupted by rain, so he was forced to finish his final two holes Saturday morning before Round 3 began. Spieth quickly made a bogey to drop out of a share of the lead through 36 holes. It didn’t get much better for Jordan when the third round began. He opened with a birdie on Pebble Beach Golf Links’ 1st hole, but two bogeys on the back nine dropped him down the leaderboard and out of the hunt. In the end, he shot a two-over 74 and will begin the final round eight shots behind Casey.